We are proud to announce the addition of another apartment to our Prague portfolio. We have continued our theme of merging sleek modern touches with the innate charm of historical Prague in this elegant city centre apartment. We hope to have captured a unique style and elegance as well as offering value for money. Much thought and care has gone into the decoration and choice of locally sourced antiques which are used to highlight original features such as high ceilings, original doors, windows and parquet floors. This city-centre two-bedroom Prague apartment has two large bedrooms, a spacious living room with flat screen TV, Satellite and DVD. There is a separate toilet and large bathroom. The apartment also has a balcony where you can enjoy a relaxing evening drink or morning coffee. My wife and I bought our first Prague property in 2004 and have since built up a portfolio of eight holiday apartments with a value of approx 137m CZK/6,5 m USD, of which approx 1,7 m USD is owned and the rest leased. We specialize in short-term rentals which we manage together with a small team through our sro MJMorris Apartments and Developments. We develop properties from complete renovation and/or refurbishment into successful holiday lets and acquire apartments through lease or purchase in the most prime locations the city has to offer. We still consider ourselves a ‘boutique’ business with a philosophy of quality over quantity with the number apartments we take on. We take great care in both design and presentation of our rentals, as well as the services we offer. We have a small and dedicated team who all have approx 10 years experience in hospitality and we only take on renovations projects which capture the spirit and history of Prague while maintaining all the comforts of modern living. We also provide consultation in all aspects of Prague real estate investment but specialize in the holiday rental sector. We are especially excited about merging property development with tourism. We are passionate about what we do and with approx 700 five star review of our eight Prague properties (8339514, 8460118, 88378 first and second floor, 97558, 1980948, 811267 and 93243) advertised on three platforms, feel we are on our way to achieving our goal of providing the best Prague holiday apartments and services on the market. We look forward to accommodating you and/or sharing our invaluable experience in what is an fast-moving and dynamic growth industry. With a fabulous layout, two large bedrooms, a living room with both bedroom individually accessible, this apartment is ideal for families and groups of up to six. The decor is stylish and minimalist, striking the perfect balance between atmosphere and comfort. A balcony just off the kitchen is ideal to relax and enjoy and morning coffee or evening wine. Our previous guests have enjoyed the large space, comfort and atmosphere of the apartment. The location has also been popular as in maintains a neighbourhood feel while still having easy access to the Old Town, just a few minutes away. There is a large bathroon and separate WC. Parking can be arranged in paid-for secure parking lots 5 mins near the apartment. Taxi transportation can be arranged also with our friendly and reliable taxi company, who will pick you up directly from the airport and take you to the apartment. Groups of up to 4 cost 25 Euro, groups of up to 8 cost 35 Euro. Our drivers all speak English are friendly and will be able to give you advice bout Prague during your journey. The owner/representative will then meet you at the apartment to provide you with further information about your stay and the city. This is a beautiful classic apartment with everything you’d need - kitchen with basic coffee supplies, room to spread out, 1.5 bath (only half bath has full toilet, full bath has urinal only) with nice deep tub and shower, cute little balcony, washer with drying rack for laundry. The apartment is as pictured on Vrbo site. The building is securely locked, felt very safe. Ilan was very helpful at checkin. The only downside, and I do mean only, is that the apartment is on a street with a couple of cafes and there was some noise at night. It did seem to die down around 11:00/11:30 pm. Something to consider if you are a light or early sleeper. At the moment there is construction across the street that starts around 7 am on the weekdays we were there. If the night noise might be an issue I’d contact Ilan and check on the other properties they have in the city - I’d trust their input and all interactions were very professional. Enjoy your stay!! We were a party of 4 adults and 2 older teenagers staying in Ilan's wonderful apartment. Prior to arrival the communication with Ilan & Viktoria was brilliant. We arrived earlier than initially expected and this was no problem and easily accommodated. The apartment was very spacious with the kids (17 & 18) in one room, their parents on the bed settee and us in the larger of the two bed rooms. There was ample storage space and the beds, including the bed settee, were very comfortable. The kitchen dining area was well equiped with everything you'd need. We spent a lot of time at the table playing games and chatting. Nothing was too much trouble for Ilan and when the toaster stopped working, an new one was delivered whilst we were out. The immediate vacinity has some superb bars (where we often finished off our night) and lovely cafes and restaurants. All key tourist attractions are within easy walking distance and the main (no 22) tram can be boarded a 5 min walk away. There's a small grocery shop near by and a large Tesco near the tram stop. All in all the apartment(and the hosts) was fabulous, the location was ideal and the City of Prague, a true joy. Our sincere thanks to Ilan & Viktoria. Stayed here with my wife and another couple whilst visiting the Christmas markets. The apartment was well equipped and very spacious. Ideally located within close walking distance to local bars, restaurants and shops. Ilan was very helpful, arranged our taxis to and from the airport and also answered any questions we had about places to eat and things to do and see. Would recommend this apartment! Beautiful apartment convenient to all we had planned for our time in Prague. Owners very responsive and helpful with questions and recommendations. Comfortable home away from home. Would return many times again. Thank you. Meticulous property in a great location. This central down-town Prague apartment is located in a historical building in Prague 1, steeped in history. Hidden away from the main tourist bustle you will find the area has a local feel, yet it is cetral enough to allow easy access to all the main attractions. The national theatre is a 5 min walk as is the famous Café Louvre, which Einstein once frequented. Prague's most well-known restaurant and brewery, U Fleku, is a 2 min walk up the street. This is the oldest brewery in central Europe and has been brewing beer for over 500 years. 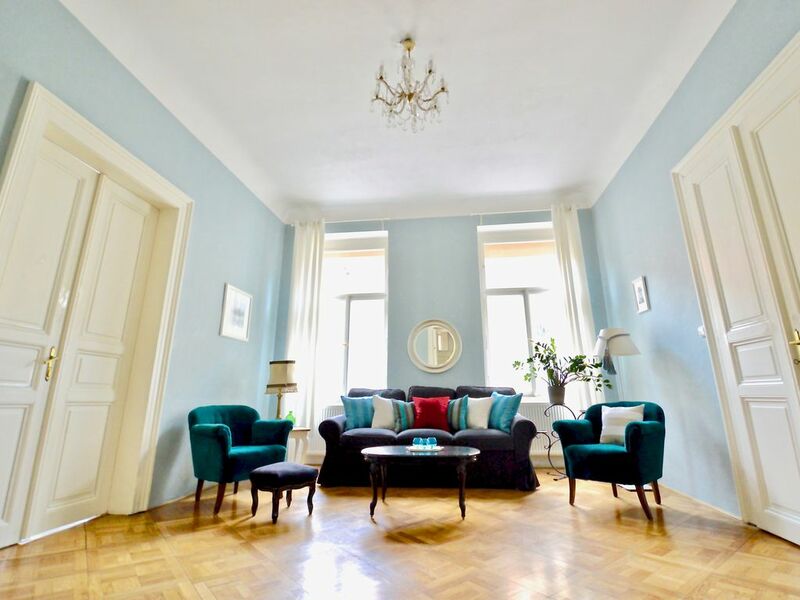 A beautiful walk through the winding, cobbled streets around the apartment, which abound with ornate restaurants shops and cafes, will take you in 5 min to the Vltava river from where can enjoy a pleasant 5-10 min walk along the river to the Charles Bridge. A few mins walk from the apartment will also take you to Narodni Trida and Wenceslas square. From Narodni Trida you can catch the number 22 tram to the castle and Mala Strana.